There is the fantastic cheap Chinese food place in State College. I always have cravings for traditional meat based Chinese food but being a vegetarian means that I cannot have it. Broccoli in brown sauce is a good substitute but I really love a good tofu dish because it mimics the texture and taste of meat the best. At Uncle Chen's, they have General Tso's Tofu and it is awesome - literally the best tofu I've had in my life besides the Pho place here. The tofu is crunchy yet soft from the sauce, the rice is always perfect and the sauce is exactly as I remembered. I wanted to recreate this dish at home and I found it super easy once you know the tips. I used this recipe to make my fried tofu without the nutritional yeast but there are couple of key points to emphasize. 1. 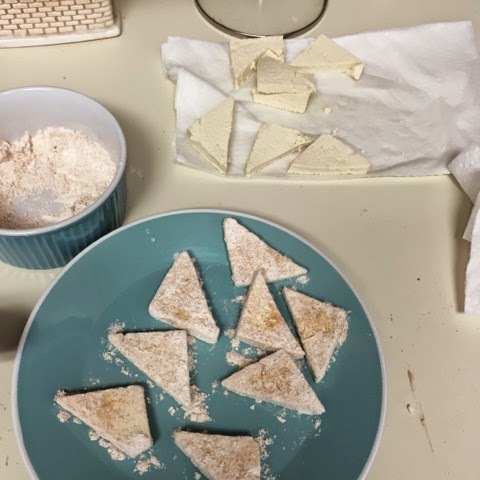 Make sure that you dry your tofu for 5 minutes before breading it. I left my cut up tofu (more surface area for drainage) on a couple of paper towels to get the liquid out. This makes it easier to fry and easier for the flour coating to stick. 2. 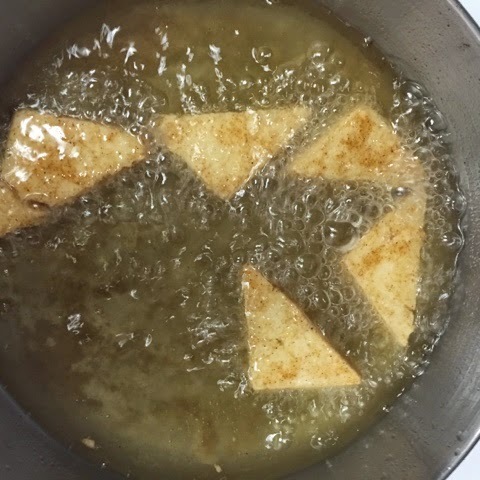 Completely submerge the tofu in oil for the best fry! The oil should be very hot when you start frying as well. I was taught that if a drop of water flung at the oil bubbles on the surface and evaporates within 5 seconds, the oil is ready. 3. Fry each piece until it is almost hard on the outside. This will make sure that the sauce does not make the coating soft quickly. In large quantities, keeping the tofu warm in the oven or toaster oven keeps it all crispy until you are ready to dig in! Dress with sauce right before serving or for a fun party food - use as dipping sauce on the side. 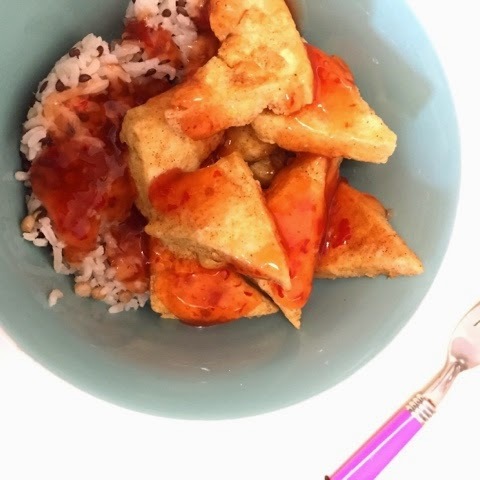 I used Trader Joe's Sweet Chili Sauce - one of my mom's holy grail products but anything teriyaki or garlicky would be great with this tofu.